While most parents, especially men, pray and wish that their first children would be spitting images of them, popular actor and comedian, Lil Win did not have such a wish. 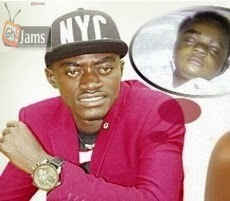 Kojo Nkansah, prayed for the safe delivery of his baby, he more importantly prayed that the baby would not look like him. Though he has endeared himself to many with his comical looks and acting skills, he honestly admits he does not have the sort of attractive looks several other male actors possess. He, therefore, did not want his son to look like him and also suffer the teasing and name-calling he endured until the breakthrough that brought him fame and wealth. “ I have always imagined the sort of name society would call my son if he looked like me. I know people would not have hesitated to let my son know how ugly he was and some could even say worse things I still hear about my looks. “ I thank God for answered prayer. My son, who was delivered three months ago, carries a striking resemblance to his mother Patricia Afriyie who is as beautiful as Nollywood actress, Genevieve Nnaji,” the actor proudly told the Showbiz, insisting he was not acting by saying that. Lil Win also admitted that he was a proud daddy and went on to talk about how fatherhood had changed his lifestyle. “ Before the birth of my son who will be called Kwabena Ampong, I’d go out and party with friends late into the night. Since his birth, however, I’ve had to stop that habit because I always want to be with him and his mother. He said when his long-time girlfriend Patricia got pregnant; he doubted if he could take care of the child considering his age. “I have always made a promise to myself to make my kids happy, but my friends kept telling me that taking care of a child was difficult . That got me a bit scared though I knew I could be a responsible father.”. Known for movies such as Azonto Ghost, Sika Kasa, Bosam Bofo, Mogya Kronkron, Obaa Nti and Agye Nyame Ba Mu, Lil Win, 26, said he had no regrets being a father since it has earned him a lot of respect. Some of his female friends , however, have not been happy with that decision. “Nowadays when the ladies see me, all they say is ‘hmmmmm! ‘Lil Win, so you are now a father’. The facial expressions even depict that of disappointment but I am not bothered. “Some people easily forget about the girlfriends they toiled with when they became famous. I will not do that because Patricia has helped me a lot. “ I know if I was nobody, the ladies who are willing to date me now would not teven take a second look at me. I will never leave Patricia for anyone else because she was with me when no one knew me,” he stated. Talking of marriage plans, Lil Win said he would fix a wedding date after the naming ceremony of his son which would be soon.